A light and crunchy feast for your taste buds! I guess if I had to name one vegetable I couldn’t live without I’d nominate the humble cucumber. For some reasons the light, fresh, crisp and cooling texture somehow never disappoints or bores me. Cucumber is so versatile and just the perfect base for every fresh salad. As you probably know by now, one of my favorite cuisines is from Thailand. 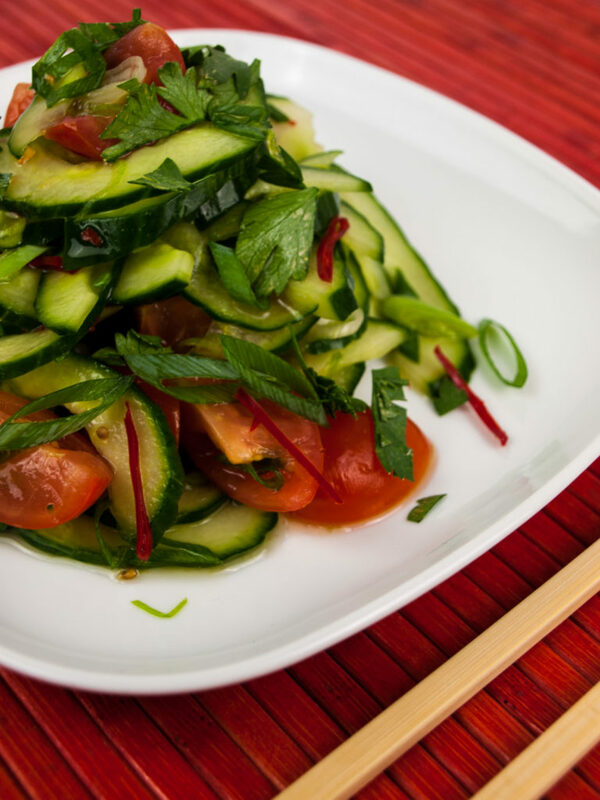 So a Thai cucumber salad is more than just right up my alley! Fresh cooling cucumber combined with a bit of zing and a perfectly balanced dressing that tickles your every taste bud. Keeping my weight on track has been a struggle for most of my life and as cucumbers are more or less just water, this is also a perfect dish for your detox-Monday after a weekend of heavy food (and maybe the 2 beers too many). Light, healthy and delicious. What more could you ask for! Serve this salad as a side dish for a Thai feast with friends or enjoy it as a filling main dish on your own. You can prepare this salad somewhat in advance and store it either in the fridge or on your kitchen counter. I prefer it at room temperate as the flavor of the tomatoes comes out a bit more. Right before serving you can drain of the excess liquid to make sure you only end up with the crunchy goodness! Fresh, crunchy, spicy and oh so tasty! Create some light Thai magic! Halve your cucumber lengthwise and scrape out the seeds with a spoon. This will make sure your salad won’t end up watered-down. Cut the cucumber into thin slices. Cut the cherry tomatoes into quarters. Slice the spring onions and the red pepper into fine rings at an angle. Roughly chop the cilantro. Mix together the fish sauce, rice vinegar and sugar until the sugar somewhat dissolves. Add the tomatoes to the dressing and slightly crush them with the back of a spoon. Add all other ingredients and mix well to combine. Garnish your salad with some more cilantro and dig in! Let me know what you think about the recipe in the comments below! Is the salad too spicy for your taste? Do you think the dressing is missing a key ingredient?